The genesis of Dynasty begins not in Denver, Colorado, in January of 1981, but out in Dallas, Texas, in the spring of 1980. That's when primetime soap Dallas put a bullet in its dastardly lead character and "Who Shot J.R.?" fever took off not just in the United States, but all over the world. ABC wanted a piece of that audience, so the king of TV producers, Aaron Spelling, took on Richard and Esther Shapiro's idea of another oil-rich family with another morally vacant patriarch: Blake Carrington. Actor George Peppard was originally cast in the role, but bowed out - reportedly because he didn't want to play a bad guy every week on national TV. The part was re-cast, this time with John Forsythe who came into the character with a directive: he wasn't going to be a bad guy; he wanted America to love him. Hence the character was changed, and although it took a while for America to take notice, it was the perfect choice. Instead of having a J.R. Ewing-type at the helm to try and cause trouble, Forsythe's Blake Carrington was trying to keep everything falling apart around him together. It allowed Dynasty to introduce a lot more unbalanced and corruptible characters around their lead actor. As originally conceived (and as can be seen in most of Season 1 of this set, and a good chunk of Season 2), Dynasty was supposed to focus on both the rich and the middle class. Blake would head up the super-wealthy Carrington clan, while actor Bo Hopkins as Matthew Blaisdel would represent the working class of Colorado. The connection between the two families (in addition to the fact that Matthew worked for Blake) would be Blake's former secretary, Krystle (Linda Evans), who he's engaged to marry as the pilot episode "Oil" (the original title for the series, by the way) opens and who Matthew once had a relationship with. As the series progressed, however, the studio and showrunners learned that viewers of the series enjoyed the glitz and glamour of the rich Carringtons far more than the average lives of the Blaisdels, and so things began to change shape on the series. The more casual fan of Dynasty may not even remember that its most famous (or is that infamous?) character, Alexis Carrington (Joan Collins), doesn't even show up until Season 2 (or the closing moments of Season 1, although Collins didn't play those few seconds that showed Alexis in dark sunglasses, as the role was yet to be cast). Here was the J.R. Ewing character that the show was missing, and a female one to boot. When this woman isn't busy trying to mess up Blake's (her ex-husband) life, she's either meddling in the lives of or bedding a large portion of the rest of the cast (often times, both!). 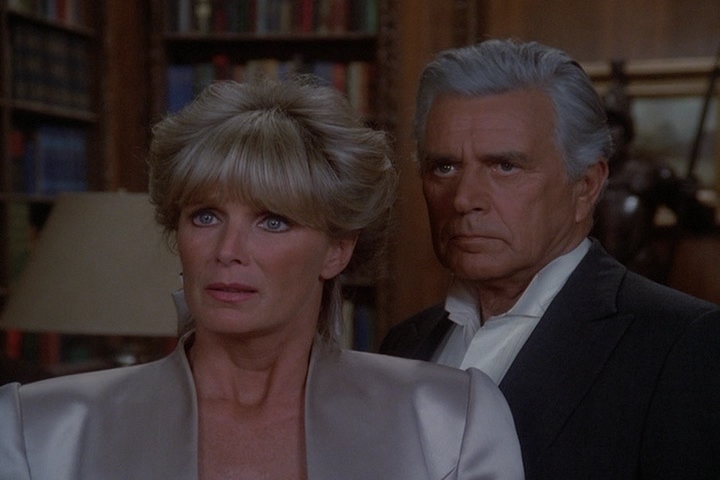 Blake and Krystle Carrington may have been the heart of the series, but it was the introduction of Alexis that turned it into "event" television. By the end of Season 2, Dynasty had crawled out of the TV ratings basement and was consistently a top-20 TV show. Although flashy clothes and over-the-top storylines dominated much of Dynasty's nine-season run, the series didn't leave the airwaves without having a little social impact as well - particularly when it came to the portrayal of homosexuality on TV. It wasn't the first series to feature a regular gay character, but it was one of the first (if not the first) to portray one in a very non-stereotypical way. Steven Carrington (played in the first two seasons by Al Corley, then through Season 8 by Jack Coleman), although fictional, was most likely many people's first exposure to that lifestyle. Which is not to say that Dynasty could be very bold about the character in the 80s. Even Blake (the hero of the series, mind you), uses the "f" word to describe his son (no, not that word...yeah, that one!) in the series pilot and then goes on to kill his son's lover (he's on trial for murder at the conclusion of the first season). Then, perhaps scared of losing viewers in the Bible Belt, the showrunners tried to make Steven bisexual for a while, which was one of the reasons Corley left the series. Homosexuality and the AIDS epidemic would also bring Dynasty into the spotlight when guest star Rock Hudson (who began a series of episodes not long before) announced that he had AIDS. The announcement brought both the series - and, more importantly, the disease - into the national conversation, leading then-President Ronald Reagan to mention AIDS for the first time publicly in September 1985. Hudson died of complications from the disease in October of the same year. But how do these episodes hold up and are they really worth revisiting? The answer is sort of a mixed bag. 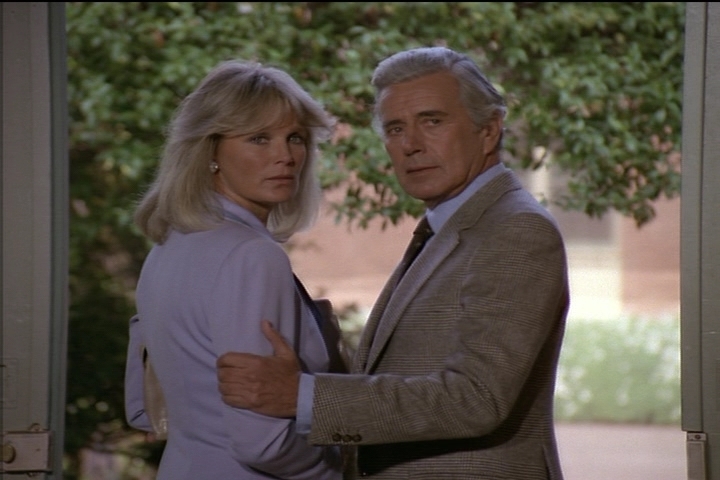 In hindsight, the series isn't nearly as well written or as well acted as its competition of the time, Dallas. On the other hand, its excess in all things - from over-the-top acting to hard-to-believe plotlines - is part of the fun. It's also quite a reflection (if slightly skewed) of the decade in which it existed. It's perhaps appropriate that Dynasty began shortly before Ronald Reagan took office and wrapped things up shortly after he left - I can think of no other TV series that better reflects the look and feel of America in the 80s than this one. Obviously, space didn't allow for a more detailed look at each season of this complete series set; however, I highly encourage readers who want to learn more to check out former DVD Talk reviewer Cameron McGaughy's coverage of most of the individual season sets. His reviews are accurate, informative, and approach the episodes with both a knowledge of them and a good sense of humor. Dynasty: The Complete Series arrives on DVD in three thick, oversized clear cases, with the first case holding Seasons 1 through 4 (22 discs), the second case holding Seasons 5 through 7 (23 discs), and the last, slightly less thick case holding Seasons 8 and 9 (12 discs). The DVDs are placed on plastic hubs, two to a side, with the discs slightly overlapping each other. In a smart move, the plastic hubs that hold the DVDs, while connected to each other, are not connected to the actual box - they just sit inside and the plastic holder can be removed. This is wise, as connecting so many discs to the cases would have surely caused the plastic of the box to crack under the weight of the DVDs. The reverse side of each case's slick (seen from inside each case) contains a list of episodes (and bonus materials, if applicable) for each of the discs in this release. The three cases slide inside a sturdy cardboard slipcase. The first case (holding the first four seasons) also includes an 18-page color booklet showing box covers for all the other complete series sets that are available from CBS/Paramount/Showtime. The main menu for each disc is simply a promotional still featuring one or more of the main characters, with menu selections on the bottom right half of the screen. Every episode of Dynasty was shot on 35mm film and each is presented here in its original TV aspect ratio of 4:3. The quality of the image depends on the season you're watching, but for the most part, these shows look pretty good. The colors are nicely saturated, details are fairly decent for a show this old on DVD, and there aren't any major glitches or issues to worry about. Viewers will note some occasional dirt and debris on the print, and I noticed a few vertical lines popping up here and there on the pilot episode, but short of a complete restoration by the studio (wouldn't that have been nice? ), these shows have remained in remarkably good shape over the years. The biggest problem watching Dynasty in the age of DVD and big-screen TVs? The stuntmen (and stuntwomen) used for the cast are glaringly obvious and the use of studio sets as opposed to shooting on location (here's a bit of trivia: the actors never actually worked in Colorado - aside from a few establishing shots, everything was filmed in California...including the famous mansion, which is located in Woodside, California). The only English track available for each episode is in Dolby Digital 2.0 mono, which is just the same audio coming from the left and right front speaker, as opposed to just it coming from the front center speaker (which is silent here). Dynasty was originally recorded in mono, so these tracks are a fairly accurate reflection of what the series originally sounded like. As far as the quality goes, the tracks sound decent enough, although (obviously) they're far from dynamic. But even though they're somewhat flat, they're not muddy, and I didn't pick up on any hissing or popping in the episodes that I viewed for this review (yes, I only watched a representative sample of the whopping 220 episodes in the series). The other audio and subtitle options vary slightly by season. Seasons 1, 3, and 4 also contain Dolby Digital 2.0 mono tracks in Spanish, while Season 2 has both Spanish and Portuguese Dolby Digital 2.0 mono tracks. Once the series gets to Season 5, only the featured English mono track is available. As for subtitles, while all discs contain English subtitles, only Seasons 1 through 4 have Spanish subtitles available, and Portuguese subtitles are only available for Season 2. I'm guessing after the first season of Dynasty was released on DVD way back in 2005 that sales didn't go as well as hoped. That's the only explanation for a bunch of bare-bones seasons. While Season 1 has three bonus featurettes, there are none on the other discs, with the exception of an interactive family tree on the final disc of Season 2 and a featurette on final disc of Season 5 (the one that ended with the infamous "Moldavian Massacre"). Given the amount of TV coverage, interviews, and all-around supplemental footage that must have been amassed for this series over the years, the paltry amount of bonus materials is extremely disappointing. Also of note: the original standalone release of Season 1 featured a pair of audio commentary tracks for the pilot "Oil" and the episode "The Separation." Those have both been nixed here. Why? I have no idea, but bonus features that were originally on the fourth disc of Season 1 have now been moved to the first disc. Al Corley: Steven Carrington Profile (5:42) - Corley played Steven for two seasons of Dynasty, and here he comments on his reasons for leaving the series. Corley would reprise the role in the post-series reunion movie which, for better or for worse (as it's pretty awful), is not part of this Complete Series set. Pamela Sue Martin: Fallon Carrington Colby Profile (5:23) - Pamela Sue Martin, who left the series after its fourth season, talks about her experiences on the series, as well as why she chose to leave. Family, Furs and Fun: Creating Dynasty (23:08) - Series Creators and Executive Producers Richard Shapiro and Esther Shapiro sit down to reminisce about how the series came to be, what their original plans for it was, and how it developed into something different than they originally intended thanks to John Forsythe's insistence that his character be likeable and the fan's reaction to the glamour aspects of the show. Dynasty Season 2 Family Tree - This is a text-only small (only a few characters) family tree that allows viewers (via remote) to pull up short bios of Blake, Krystle, Alexis, Fallon, Jeff, Little Blake (Fallon and Jeff's son), Steven, and Sammie Jo. Entertainment Tonight Interview 1985 (2:06) - In this clip from the once-popular nightly entertainment news show, co-host and correspondent Leeza Gibbons covers Rock Hudson's guest appearance on Dynasty. It's all here in one big set. All the crazy cliffhangers. All the wild plots. All the men that Alexis Morell Carrington Colby Dexter Rowan married. Dynasty: The Complete Series is a blast from the past, and what this set lacks in bonus materials or top-notch A/V, it more than makes up for in nostalgia and cheesy fun. Recommended.